This month, UC Santa Cruz grad Matthew Palm (Kresge, History, '10) writes from China about his teenage students and the impromptu English speeches he asked them to give. Palm has filed periodic blog reports from China since August at http://blogs.ucsc.edu/topics/slug-in-china. During a recent class, Palm writes, one of his prized students expounded on why China was better than Japan. The map of China looks like a chicken, she explained, and Japan looks like an insect. “And you know what, CHICKENS EAT INSECTS!” she said to the whoops of her classmates. In previous blog posts, Palm has written of the guff he got from fellow teachers when he declined to eat rice. He also noted with some satisfaction how the Betty Crocker-cookie-mix chocolate chip cookies disappeared after he made a batch. Palm recalls a class at UCSC on China's Cultural Revolution. "I used to find it hard to believe that bands of high school and college-age teenagers could run around China bringing down local government leaders …," he wrote. "Now I firmly believe in the power of angry, organized Chinese teenagers. "I sure hope the Beijing government manages to create jobs for my students’ generation. If they don’t, a lot of heads will roll." 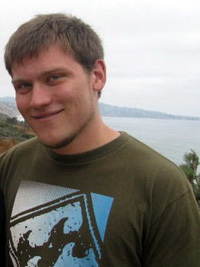 As a senior, Palm was commissioner of academic affairs for the UCSC student assembly.